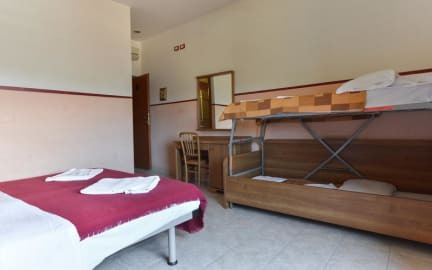 Hostel Vacanza i Roma, Italia: Bestill nå! Our hostel is situated in the centre of Rome, 15 minutes from the Piazza Venezia, the Pantheon, Via Condotti, Colosseo and Piazza di Spagna. Termini station is a 3 minute walk away. Our location is perfect for those who wish to spend some time shopping, dining out or exploring our ancient city. 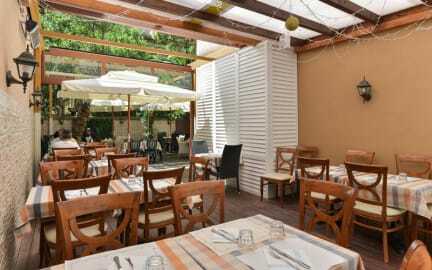 As we also have a restaurant, a pizzeria and a bar next door, our guests are entitled to 10% discount to food and drink. A light breakfast is included in the price, as is use of our permanently hot showers, T.V reception and luggage storage. Please check-in at Via Palestro,65. which is about three blocks away from the train station. Once you are at the train station, exit at VIA MARSALA and cross the zebra stripes. Continue straight ahead, you will find yourself on VIA MARGHERA. After having walked more or less three blocks down you will arrive at Via Palestro. Take a left and in front of you there will be a sign with 'Bar Pizzeria Ristorante' written on it. The beds will not be ready until 1pm. Luggage can be left in storage until the rooms are ready. Cancellation policy:booking has to be cancelled before the midnight of the day before the day of arrival; i.e. if you booked the 16th you need to cancel before the midnight of the 14th.